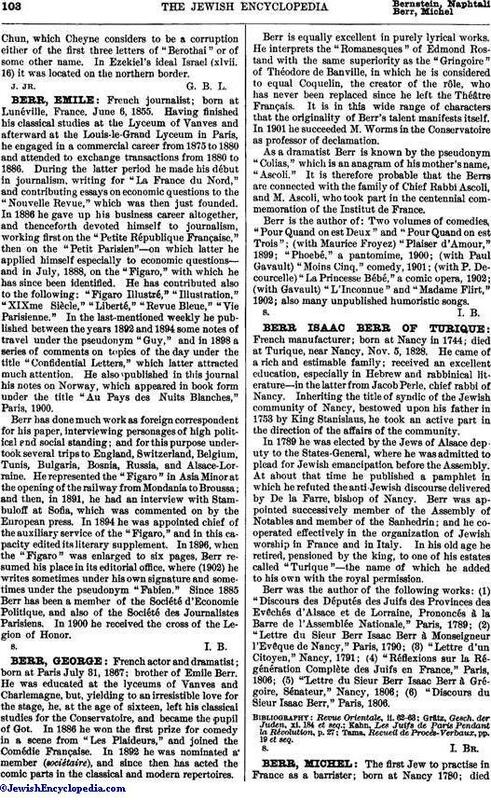 The first Jew to practise in France as a barrister; born at Nancy 1780; diedthere July 4, 1843. His father, Isaac Berr de Turique, who made himself known by his great ability as a writer and as a champion of Jewish emancipation, intended his son to continue his work. With this end in view, he had him carefully educated by the most eminent masters. The poet Wessely recommended to him as a teacher a learned young man of Breslau, Benjamin Wolf, who in France assumed the name of "Louis." Under the direction of this Louis, Michel made rapid progress in the study of the Hebrew and German languages and literature. With no less success he attended the lectures of the central school of Nancy. At Strasburg, where he studied law, being at the time scarcely twenty years old, he began his career as an author with a pamphlet entitled "Appel à la Justice des Nations et des Rois," or "Adresse d'un Citoyen Français au Congrès de Lunéville, au Nom de Tous les Habitants de l'Europe qui Professent la Religion Juive." This was an eloquent protest against the oppressive anti-Jewish laws then existing in the greater part of Europe. On graduating from the university Berr returned to Nancy, where he pleaded brilliantly in several celebrated cases. At the same period he addressed to the minister of public worship observations on the speeches delivered by the latter on the law of Germinal 18, tenth year: he protested chiefly against the omission of any mention of Jewish worship in the Concordat. About 1803 Berr accompanied his father-in-law, Berr-Bing, to Paris, where he soon made himself known by several literary articles in the "Décade Philosophique." Three years later he was elected deputy to the Assembly of Jewish Notables, and in the following year was appointed secretary of the Grand Sanhédrin. Through this honorable title and the French translation he made of the Hebrew poems of Kargan, Cologna, and Meyer in honor of the emperor, he gained the favor of the government and was called to the post of chief of division in the Ministry of the Interior in the new realm of Westphalia. There he made the acquaintance of the Swiss historian Johannes Müller, who, in his letters to his brother, speaks of Berr in most eulogistic terms. On his return home, in 1809, Berr was appointed head of the office at the prefecture of Meurthe. At this period he published his "Essai sur la Vié et les Ouvrages de Bitaubé," and many papers on various subjects mentioned in the memoirs of the Academy of Nancy. In 1813 he returned to Paris, and, giving up his practise at the bar, devoted himself to literature. For three years he collaborated with the "Mercure de France," "Mercure Etranger," and "Magasin Encyclopédique." In 1816 he lectured on German literature at the Athénée Royal of Paris, and translated into French the tragedy "Luther" by Werner, accompanied by notes. His competence as a translator was much appreciated; and in 1817 he was appointed translator of the German papers at the Foreign Office, a post which he occupied until it was abolished in 1823. The great reputation that Berr enjoyed excited the hostility of the envious; and attacks in the press made by his adversaries affected him deeply. He was particularly disheartened by his unsuccessful candidature for membership of the Central Consistory, this position being one that he greatly coveted. In 1826 he went to Brussels, and devoted himself to politics. On his return he wrote on the works of Salvador, and contributed to the "Gazette des Cultes." In 1837 he left Paris and settled at Nancy, where he quietly worked until his death. Besides the above-mentioned works, Berr contributed numerous articles to scientific journals. 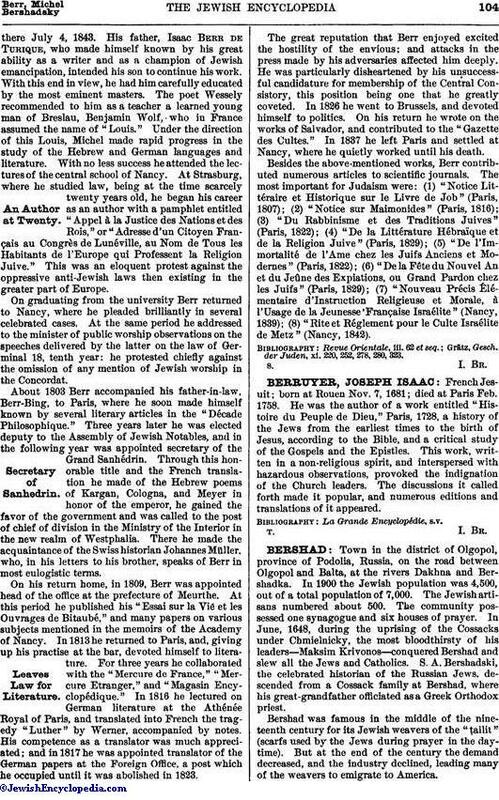 The most important for Judaism were: (1) "Notice Littéraire et Historique sur le Livre de Job" (Paris, 1807); (2) "Notice sur Maimonides" (Paris, 1816); (3) "Du Rabbinisme et des Traditions Juives" (Paris, 1822); (4) "De la Littérature Hébraïque et de la Religion Juive" (Paris, 1829); (5) "De l'Immortalité de l'Ame chez les Juifs Anciens et Modernes" (Paris, 1822); (6) "De la Fête du Nouvel An et du Jeûne des Expiations, ou Grand Pardon chez les Juifs" (Paris, 1829); (7) "Nouveau Précis Élémentaire d'Instruction Religieuse et Morale, à l'Usage de la Jeunesse Française Israélite" (Nancy, 1839); (8) "Rite et Réglement pour le Culte Israélite de Metz" (Nancy, 1842). Grätz, Gesch. der Juden, xi. 220, 252, 278, 280, 323.